Whole books have been filled in efforts to interpret the work of Rem Koolhaas. But according to Albena Yaneva of the Manchester School of Architecture, his work can only be understood through the design process that unfolds inside the office on Heer Bokelweg in Rotterdam. According to Yaneva, architecture is all too often interpreted in terms of theoretical movements, the individual background of the architects, or the socio-cultural conditions in which a building is created. Yaneva suspected that design practice  all that niggling work, the interaction between architects and the surroundings in which the offices designs are created  has a large bearing on the buildings produced by OMA. She had a chance to spend two years conducting anthropological research into the daily practice inside the Rotterdam office of Koolhaas and arrives at convincing conclusions that can indeed make you look at the work of OMA in another way. A familiar but good example is the design for the Casa da Música in Porto. Koolhaas told Yaneva that just before he was asked by the Portuguese client to design the concert hall, he was asked by a Dutch client to design a new house. When the Dutch client rejected the design, the drawings disappeared into the archive but were soon taken out again for the Casa da Música commission. The role played by models inside OMA is noteworthy. During Yanevas research period new designs were almost always  the CCTV building in Beijing was an exception  designed using traditional models in which blue foam dominates; only much later, or not at all, did the computer enter the design process. Models offer a way of experimenting quickly, is the view at OMA. Moreover, with various completed buildings one can see that the design started life as a sketch model, even though designing often continues right through to construction. A funny example is that the extension to the LACMA in Los Angeles has a roof that allows sunlight to filter through  an idea based on the use of stockings in the model. The importance of models in the OMA building is illustrated by Yaneva with an anecdote. 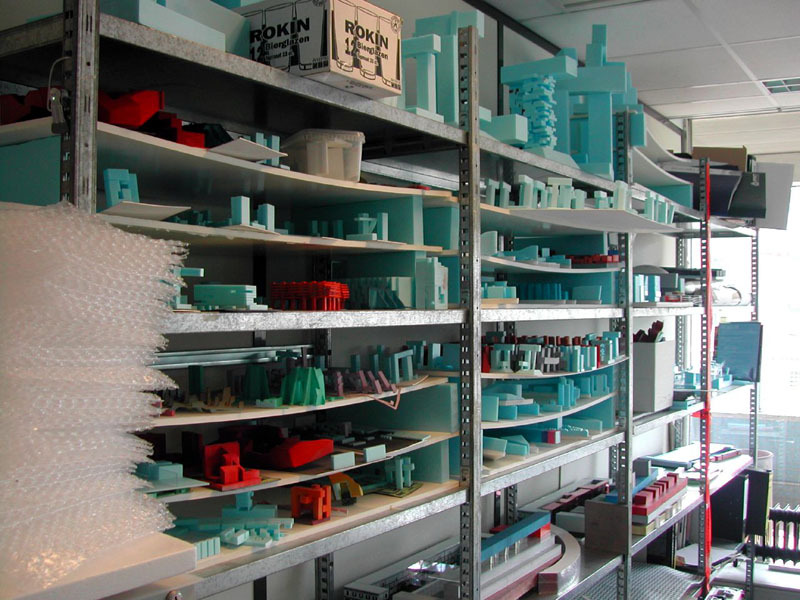 On one occasion Koolhaas had seen so many blue-foam models that he banned his staff from using the material for a month. Disbelief and shock around the office ensued. This studio can not work without foam. Its not possible!, says one employee. This episode prompted Yaneva to assert the independence of the model within the OMA design world. The way in which models are used and qualities and characteristics are ascribed to them is hilarious. Yet Yaneva convincingly concludes that the model can have a mind of its own. She shows how OMA architects arrive at a rough design that has the potential to develop into a building. Such a moment is followed by a ritual dance in the office in which the architect is transported by the possibilities of the design and involves the other staff in his enthusiasm: There is some sort of energy in the monster model. In the process of questioning it and responding to its demands and profound appeals, the designer becomes a victim of the building-in-the-making. At any moment in the design, this piece of foam, this monster model tells her I am here, but there is more to be done. Models deemed to be of great potential acquire a status and are stored in the OMA archive. They have all completed the process of becoming high-potential designs; by constantly adjusting and perfecting them, the designs of OMA gain content and meaning, and that makes a simple categorisation difficult.